← It is almost like we’re all connected somehow. *My personal guess? I think urban conservation has relatively high yields (for providing additional water to cities), then the results drop off very quickly. Oh! Groundwater re-charge is pretty powerful too. I don’t think new dams get us much yield, which is why I don’t pay a lot of attention to them. I don’t think that agricultural water conservation gets at a ton of new water, because water is re-used in the ag valleys. Frankly, after water conservation and storing water underground, I think the next source of water comes from retiring ag lands. If you don’t like that, you should go back to thinking about moving the purple line down. Doesn’t all this graph show is that “drought” is “normal” and a misnomer? Great post — I am going to link to it! Thanks for sharing. It leaves me with more questions than it answers. Please provide some more context when you have a moment. What Water Plan? What is the source of this and what water does it include? Is it all water for the state or for just the Sacramento/San Joaquin Rivers watershed? My understanding is that it is a conceptual graphic, not tied to any specific metric, but intended to represent some idea of Californian hydrology. Oh, the California Water Plan. Bulletin 160, mandated by the legislature for five year updates. 2009 will be coming out in the next few months. I think charts like this are helpful if we assume that it is accessible water. It would not be helpful if, for example, it included runoff from the Klamath River watershed. 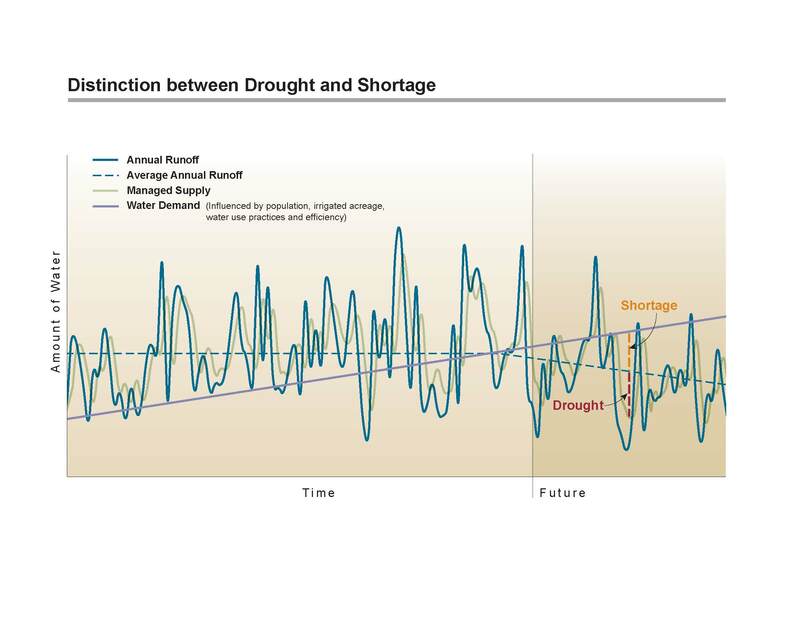 ;-) I mostly like how this chart provides a visual image demonstrating the difference between what is meant by water shortage and drought. I can only hope this chart is included in the water plan using real numbers for the major watersheds we rely upon for water. You seem curious, so here is some of the historical data for run-off. I don’t know whether the Water Plan intends to put that kind of run-off data in each regional chapter. (People who are serious about it can get (some) modeling-quality data from the department or a couple different universities.) I am positive that no one has any quantitative data about where the purple demand line should go. That would require measuring people’s wishes, which so far we haven’t done. Actually, as rate hikes go into effect we are accumulating aggregate knowledge of the demand curve for water. Smart water utilities will hire an economist or statistician and map out the demand curve using historical data while weighting more recent rate hikes proportionately more. Those districts’ subsequent rate hikes will be more highly tuned as a result. I know at least one suburban utility that is doing so. In that district one can rely on few abrupt changes of behavior. In more ag-based districts I would imagine this could be difficult. ooooo, data! thx. I dropped it into a spreadsheet and made a couple charts. A chart of the sum of Sac and SJ Rivers runoff look a lot like the chart above. :-) I’ll save the file and bookmark for later when I have time to consider further. Tremendous graph…but I’ve never seen such a vague time scale in all my life. Is that just the way the DWR does things, or is there an time in years that I’m overlooking? My understanding is that the graph isn’t meant to depict any literal hydrologic metric, nor specific time. If I remember right, they don’t like to put years on projected hydrologies, because people will take them as predictions of a big flood or big droughts in specific years in the future, rather than examples of what might happen under a climate change regime. Brent – you’re totally right that this is a great time to gather usage data for increasing rates. I hope someone’s doing that. Accurate demand curves would be incredibly helpful. Beyond that, I think people’s desires for water reflect more than just price, so I don’t think a demand curve would capture everything. But it would be a great first cut.